One of the highly anticipated anime is the return of the Berserk anime that will be airing this Summer. 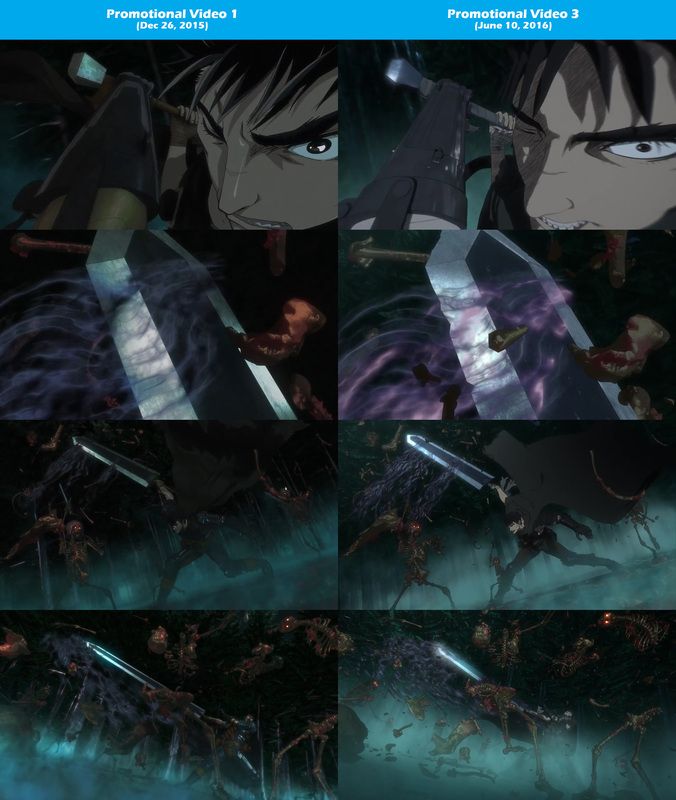 Whilst it is great to see the Black Swordsman back in animated action, reception to the anime’s visuals have been somewhat mixed. However, more criticisms have appeared with the most recent promotional video dropping earlier in the week. The third promotional video of the anime was revealed on June 10th that features new animation and the previews voice cast. The video also has remade scenes from the anime’s first promotional video that was released at its announcement on December 26th, 2016. 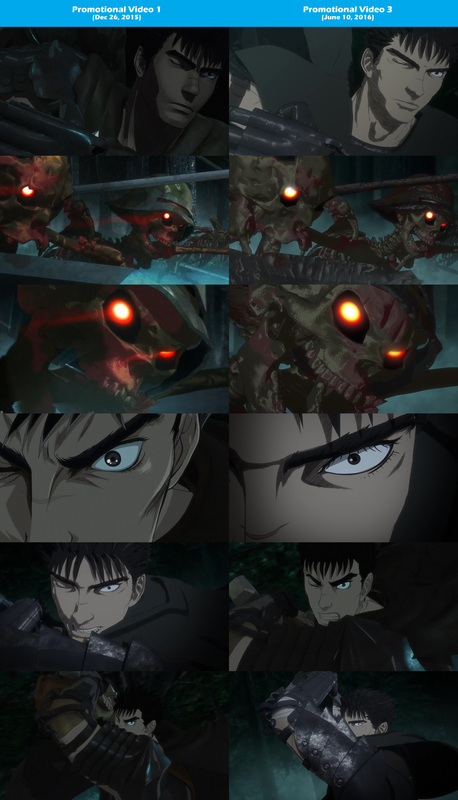 When first introduced, the anime was to include heavy CGI similar to the Berserk: The Golden Age Arc film trilogy, granted they are both produced by the same staff. But, the visuals in the latest PV has been regarded to be of a poorer quality compared to the first PV. A downgrade, as most would say. We have produced a series of comparison images so that you can form your own opinion on the supposed quality decline. The first episode of Berserk will air on Friday, July 1st at 10:30pm JST on WOWOW. The anime will also start airing on MBS, TBS and CBC a week later, with a broadcast on BS-TBS starting on the 9th. The project itself was announced in the recent issue of Hakusensha’s Young Animal magazine. Miura comments in the issue that the manga will be on hiatus until Summer next year. 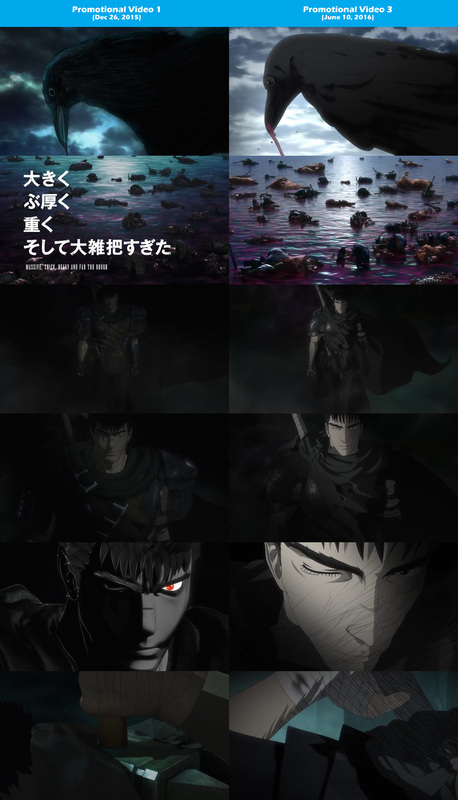 He also mentions that the new anime project will depict Guts as the Black Swordsman. The magazine has also announced that the 1997 TV anime adaptation of the series will be released as a Blu-ray boxset on April 20, 2016. The boxset will retail for ¥18,000 (~ US$148.80). Berserk is a dark fantasy manga written and illustrated by Kentaro Miura, that began in 1989. The manga is being serialized in Hakusensha’s Young Animal magazine, where a total of 37 volumes have been published to date. The series was adapted into a TV anime series in 1997 for 25 episodes, being directed by Naohito Takahashi (Danball Senki W, Steel Angel Kurumi) and animated by OLM, Inc. (Pokémon, Inazuma Eleven). The manga also received an anime movie trilogy from 2012 under Berserk: The Golden Age Arc. The films were directed by Toshiyuki Kubooka (Gunbuster and Giant Robo Animation Director) and produced by Studio 4°C (Tweeny Witches, Harmony). A brave young warrior named Guts fights for his fortune as a mercenary on the front lines. A fated encounter unites Guts with the charismatic and deadly young man named Griffith. Leading the rogue soldiers known as the Band of the Hawk, Griffith wields his formidable force like no other. Driven by a quest for status, the Hawks exert military and social prowess the likes of which have never been seen before. The armies of Midland will quake with fear as Griffith and Guts set off on a path that will bring the world to its knees. The 2016 Berserk TV anime will be airing every Friday at 10:00pm JST on WOWOW starting from July 1st, during the Summer 2016 anime season. Further information about the series will be revealed soon.